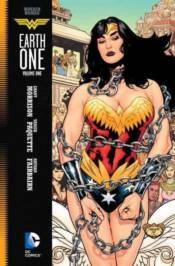 In this new installment of the New York Times best-selling Earth One original graphic novel line, Grant Morrison (THE MULTIVERSITY) joins with Yanick Paquette (SWAMP THING, BATMAN, INC.) to reimagine Wonder Woman for a new era. Encompassing the vision of her original creator, William Moulton Marston, Morrison presents a Diana who yearns to break free from her mother and the utopian society on Paradise Island to learn about the forbidden outside world. Her dreams may come true when Air Force pilot Steve Trevor crashes on their shores, and she must defy the laws of the Amazons to return him to Man's World. Is she ready for the culture shock that awaits her in America? And is the world ready for this Wonder Woman?